Here we go. Season opener on a Friday, just like back in the good old days! I mean, no, wait a minute... Well, here we go anyway. Another year of this. I'm not really going to wax poetic about fresh starts or any of that nonsense. These fixtures count the same as the ones in February and March. To that end, Arsenal have won just one of their last seven season opening fixtures and they needed an 89th minute red card to Jason Puncheon to steal that one. They've lost two straight opening day games since that win, both of which were at home. Starting on the right foot has not been Arsenal's forte. You could point to Arsenal's opening day loss to Liverpool last year as a direct cause of their fifth place finish because, hey, if they get a 4-4 draw there, they end up in fourth. I'd argue that the 37 games to follow would have played out differently if you come into them with different points totals, but the fact of the matter is, Arsenal consistently don't do enough business in the summer to get them ready for the campaign and it has hurt. But, here we are with two new players and nobody of consequence out (yet.) Maybe the tables have finally turned? While I think it'd be a major stretch to call Arsenal title contenders, maybe we'll at least have something new to cheer about this year. It's just been so stagnant lately. In the opening match of the 2011/12 season, Arsenal traveled to Newcastle and drew 0-0 (you may remember Joey Barton got two Arsenal players suspended that day.) The reason I bring that day up is because it was the start of the season while transfer speculation swirled around the future of Cesc Fàbregas. I went back to my match preview and found it was suspiciously silent on both he and Samir Nasri. Neither of them played that day; Cesc was sold two days later and Nasri fucked off to City 11 days later. So you can see why there's some suspicion over Alexis Sánchez's abdominal injury. Once bitten, twice shy and all that. However, David Ornstein of the BBC, whose word is as close to God's among journalists who cover the club, has gone on BBC 5 to insist that Alexis's injury is genuine. So, that's the state of things. Alexis will miss this match and next week's trip to Stoke, as will Laurent Koscielny, who will serve the rest of his suspension for the red card he received against Everton at the end of last season. Gabriel, who injured his knee that day, remains out, as do Jack Wilshere and Santi Cazorla. There are a lot of doubts in the Arsenal squad, but Per Mertesacker (head gashy thing,) Mesut Özil (fluid in his ankle,) Aaron Ramsey (calf,) and Francis Coquelin (ankle) were all in full training on Thursday. Coquelin is not expected to be available, but the BFG's availability means the club won't have to rush medium-sized German Shkodran Mustafi back into the fold. Predicted XI: Čech, Holding, Mertesacker, Monreal, Bellerín, Kolašinac, Xhaka, Ramsey, Özil, Welbeck, Lacazette. Center back Robert Huth, who scored the only goal for either club in the two meetings between them last season (into his own net,) is out after ankle surgery; he is back in full training and is expected to appear for the Under-23s on Monday. Harry Maguire, signed this summer from Hull City, is expected to deputize. Midfielder and summer signing Vicente Iborra picked up an ankle injury in training and is expected to miss out, too. There are doubts over Danny Drinkwater, who missed Leicester's final preseason fixture against Borussia Mönchengladbach with a thigh problem, as well as the recently signed Kelechi Iheanacho, who picked up a foot injury in that match himself. Islam Slimani is short of match fitness. Riyad Mahrez and Damarai Gray have both been connected to transfers out of the club, but they're both still with the squad for now. Predicted XI: Schmeichel, Simpson, Maguire, Morgan, Fuchs, Mahrez, Gray, Ndidi, Amartey, Okazaki, Vardy. Arsenal's run of 20 seasons qualifying for the Champions League came to a halt last season as the club finished 5th in the Premier League, this in spite of the fact that the club finished with more points last season than in 10 of the 20 years they did qualify. It was a lot of same old, same old with Arsenal's season. They lost in the fifth round of the League Cup. They won their Champions League group, drew Bayern Munich anyway, and shipped 10 goals in the Round of 16. They won the FA Cup. They finished with 75 points in the league. Aside from the fact that they finished 5th, you could pretty much describe any number of the past seasons in similar terms. It's just so predictable, maybe the writers' room of this god-forsaken sitcom should be replaced with fresher blood. Perhaps that fresher blood will come in the form of the Europa League. Leicester City, of course, came into last season as the reigning champions, and while they had a bit of fun in Europe en route to the Champions League quarterfinals, their domestic campaign saw them finish 12th. The Foxes won just five of their first 25 league matches before Claudio Ranieri was sacked, then won five on the bounce to climb out of relegation danger. And while they only won two of the remaining eight that followed that streak, the club were safe by 10 points. 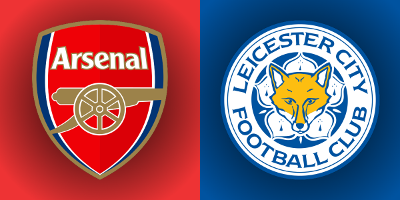 Leicester have not beaten Arsenal in their last 23 tries, dating back to a 2-1 win on November 23, 1994. The Foxes did, however, advance past Arsenal via a penalty shootout in the 2000 FA Cup fourth round, after consecutive 0-0 draws. Arsenal took four of a possible six points against the defending champions last season. In the first meeting at the King Power Stadium, played in the second week of the season, the clubs played a 0-0 draw. Mark Clattenburg denied Leicester two possible penalties, including one in second half injury time. This corresponding fixture last season also looked like it was going to be a 0-0 draw, but an 86th minute Robert Huth own goal saw Arsenal come out 1-0 winners in an incredibly sloppy game. Leicester City have not won at Arsenal since a 2-0 win on September 8, 1973. The referee is Wirral-based Mike Dean, unfortunately. Arsenal have seen Dean four times since his adventures with Diego Costa at Stamford Bridge on September 19, 2015. The first three of those matches were scoreless draws: 0-0 against Hull in the FA Cup, 0-0 at Sunderland, and 0-0 at home to Middlesbrough last year. The hex was finally broken with a trip to Stoke last year and a 4-1 victory on May 13. I want that to sink in a little bit: Arsenal went to Stoke and won by three clear goals with Mike Dean. Like, I kind of don't believe that happened. I'm pretty sure Peter Crouch scored with his hand, though. John Painting is a contributing writer to the Modern Gooner and your favorite fictional character. You can follow him on Twitter @zorrocat for a stirring narrative arc.